(ARA) - Does spending time on your deck "do it for you" - or does your deck simply "do the job?" Now that warm weather has arrived, you'll be outside more; your outdoor space should be an area that you truly enjoy and are proud to show off to company. You may not need a complete deck remodel to achieve that level of perfection. With some smart deck upgrades you can create an upscale look for less. Remember, your railing doesn't have to match your current deck material. If you have a wood deck that doesn't necessarily mean you need wood railings. Think outside the box and blend different colors and materials - such as aluminum, glass and composite - for a complementary look that increases the aesthetic appeal of the entire house. Aluminum railings are increasingly popular because they allow homeowners to introduce a variety of baluster infills into their deck design. Durable yet lightweight, aluminum won't rot or corrode, making it a good choice for the outdoors. 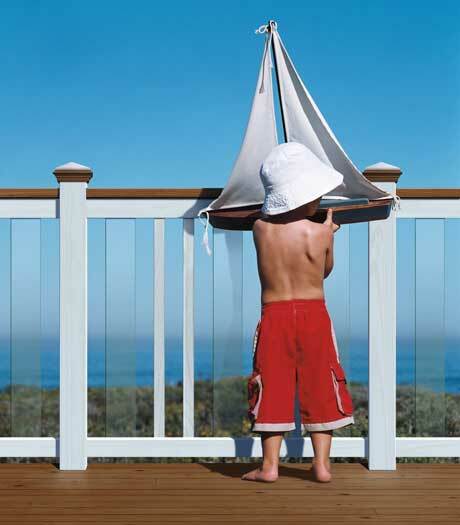 One example is Deckorators aluminum railing kits, which come in a variety of designs that are black or white powder-coated to weather the elements, plus they're backed by a lifetime limited warranty. If you like the look of wood, but want something more durable without the maintenance hassles, consider railings made from composite materials. With a look that emulates real painted wood, composite railing options won't split, warp, rot or suffer from insect infestation. While you're researching railings, it's wise to also look at balusters - the railing spindles - and decide what styles you like best. You can mix and match with your railing materials to get a one-of-a-kind look. Metal and aluminum balusters are popular and come in many shapes, styles, colors and sizes. Some simple changes to your current deck structure can take it from drab to fab without the cost of a complete remodel. Explore your options today to create a deck you'll enjoy for many seasons to come.